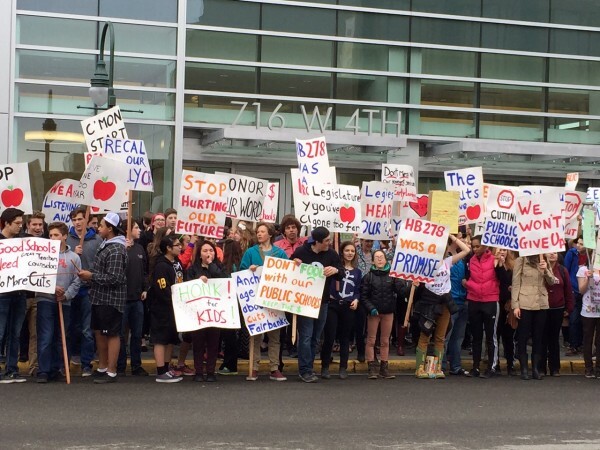 More than 150 high school students walked out of class Thursday afternoon to attend an impromptu rally at the Anchorage Legislative Information Office. They are protesting the legislature’s proposed $47.5 million cut to education. West High Junior Charlie Lowell led the crowd, sending a message to Alaska’s state legislature. “They’ve been encouraged to even cut education further,” he shouted into his bullhorn. “Boo! !” responded the sign-toting crowd. Lowell helped organize the protest through word of mouth and didn’t let parents or teachers know until the last minute. 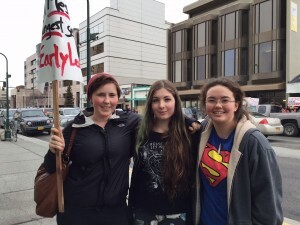 Students at the protest say their teachers had mixed reactions — many supported the idea but others were skeptical that any students would actually show up. The legislature needs to send their final budget to the governor by the end of session on Sunday.